School Ethos Forti Nihil Difficilius – Nothing is too difficult for the brave The school’s aim is to create well-rounded, enquiring young women who will be able to think critically and engage constructively with others. Girls are encouraged to contribute to the community and value their role in South African society. The entire school took part in the 2015 67blankets for Nelson Mandela campaign, making 695 blankets. 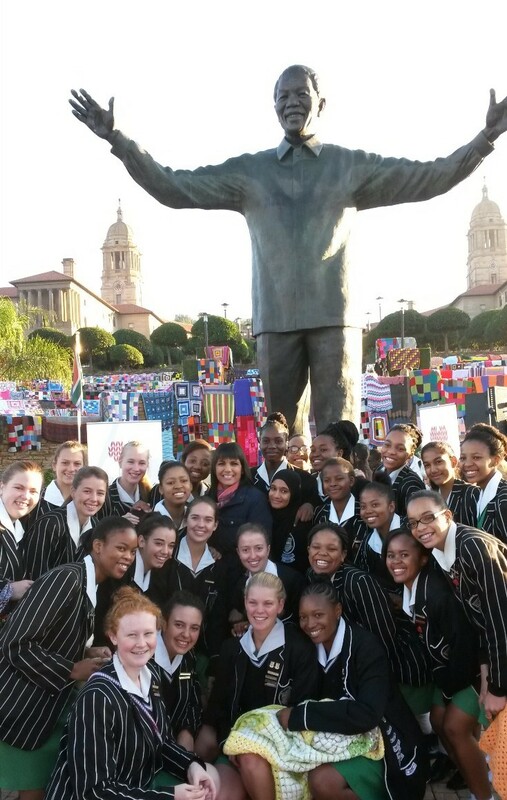 Matric learners are seen here with Leanne Manas of SABC Morning Live at the Union Buildings where a Guinness World Record was achieved for the largest crochet blanket in the world (3377m²). The focus of Jeppe High School for Girls is primarily on academics. The school endeavours to ensure that each pupil achieves her academic potential while engaging in a range of sporting, cultural and social activities. Our staff are dedicated to teaching and to the school and with their enthusiasm and loyalty, encourage independent thought and an appreciation of learning amongst the pupils. Jeppe High School for Girls has consistently been in the top three public schools in the district and has continued to produce excellent matric results. In 2017 the matrics again achieved a 100% pass rate and all of our learners qualified to continue with tertiary education, with 89% of them attaining the requirements for entrance to a bachelor’s degree at university. Jeppe High School for Girls was selected as one of the ten 2007 winners in the Maths and Science Excellence Award supported by Anglo American. The school received a grant of R150 000 from the Anglo American Chairman’s Fund in recognition of its consistence in excellence and performance. We also gratefully acknowledge the generous annual grant from the Epoch and Optima Trusts since 2009 to enhance Maths education at the school. Jeppe Girls was ranked as the Top School in Gauteng by Beeld on 29 January 2010 and is consistently acknowledged by Wits University as one of their Top Feeder Schools. In 2013, the school was named an Allan Gray Circle of Excellence School. The school is situated in Kensington, Johannesburg. A map to the school can be found under “Contact Us”.